TRIO!… RIOT!… PUNK!… JAZZ!… BOOOOOOOOOOM!!!! It’s OK – I haven’t ‘lost it’ (as they say)… but this saxophone/drum trio is perhaps as hard-hitting and as ‘in your face’ as they come. 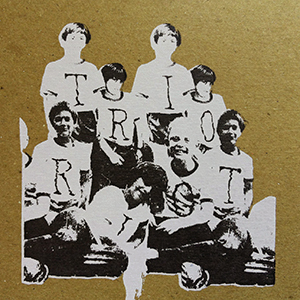 Released on the Efpi label, already renowned for blazing a trail of alternative improvisatory forms, Trio Riot bring us an eponymous album of honest, edgy, brash, chordless energy. With a sound that might encompass the ’60s jazz innovation of Ornette Coleman and Eric Dolphy, the gritty North-Eastern blues of Back Door and the anarchy of mid-’70s British punk, Anglo/Danish/Swiss band Trio Riot brandish an extreme vitality rarely heard on the current contemporary jazz scene. Formed in Helsinki in 2009, the trio comprises Danish alto player Mette Rasmussen, Swiss tenorist Sam Andreae and, from the quintessentially northern UK oasis of Bollington (famous not least for its fine ales), drummer David Meier. Taking, as a musical parallel, the vast industrial heritage of Manchester, together these three instrumentalists creatively forge a feral, punchy and straight-down-the-line concoction of original, improvisatory, yet well-structured compositions which ‘take no prisoners’ when it comes to openness of heart and raw musical passion. You’re either ‘in’ or you’re ‘out’ (‘Marmite’-style) – but I defy you not to be impressed (as I am) with the conviction of Mette, Sam and David. Opening number, 3, fanfares the trio’s intent – grating, trilled sax solos interspersed with heavy drum responses; squawking, guttural tenor lines and shrill alto shrieks against fast-paced rhythms (those of a nervous disposition, please alight here!). Lala-lala (an onomatapaeic title) provides a percussive canvas over which Rasmussen and Andreae duel with increasing fervour; and Rondeau finds both sax players in a less confrontational frame of mind – indeed, they’re maybe of a more cheeky mindset, challenging drummer Meier to play their rasping and fun-filled game. I’m So Glad It Wasn’t Me sputters and sparks with atonal brashness; and Candid is just that – outspoken, with almost timpani-like heaviness… all good stuff! Bartstock opens (and closes) with contrapuntal vigour, Rasmussen and Andreae chirping wildly in-between, against the rapid complexity of Meier’s percussion. Duo is a tense conversation between alto and tenor, though not without the suggested unwanted interjection of Meier’s ‘nails on blackboard’ cymbal-screeching; and Guru is an all-out rumpus, with impressively anarchic, tremulant, harmonic tenor whinings. Unsurprisingly, Dadadadadadadada (is that enough ‘da’s?) is an intense three-minute celebration of all things reed and percussion – love it or hate it, it’s simply (for me, at least) sheer, unalloyed madness… but all in the best possible taste! 31 is sparky, blistering, riotous and altogether… well, wonderful. And Disorder (Joy Division) just revels in the relentless punky/’discoey’ groove laid down by David Meier, Andreae’s tenor improvising against Rasmussen’s quirky, repetitious and percussive alto. Drawing breath, closing number The Last Hurrah finds a corrupted solace in the searing, sinewy combination of cymbals and reedy harmonics, until alto and tenor find a mutually common ground and, finally, real beauty in their partnership – a mutual coming-together. Recorded in just two days, mixed by Alex Bonney and packaged in Efpi’s ever-distinctive screenprinted sumptuousness (courtesy of designer Simen Engen Larsen), ‘Trio Riot’ is released on 17 March 2014 – available here. Trio… RIOT!